Custom cabinetry is more than pretty cabinet fronts. The ultimate custom cabinets Tulsa wants will combine the best of many worlds, including affordability, functionality, and creativity. Getting the custom cabinets you want shouldn’t be a choice between those things, it should be a harmonious meeting of all three. Only A&S Millworks in Tulsa, OK can help you achieve that! A&S Millworks has professional mill workers and uses high-quality products. We’ll never sacrifice those things to give our customers lower prices. However, we will continue to give them the best custom cabinets Tulsa can get! We let your budget be our guide, offering you options and products that won’t break the bank! This often has the added benefit of giving customers fewer options and thereby making their custom cabinet choice a little easier! 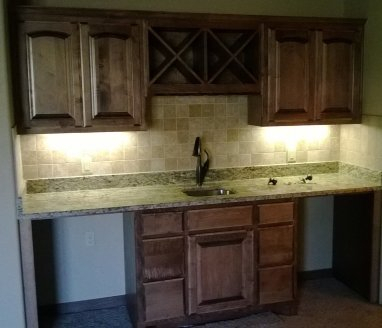 From cutlery dividers to lift-up units, we can offer all the specialty accessories you need to create the custom cabinets Tulsa residents have come to expect from A&S Millworks. We have many styles of basic cabinets to choose from, plus cabinets that work well under the sink, over the stove hood, or above the refrigerator. If storage is your most important concern when you are looking for custom cabinets, you’ve come to the right place! Built-in appliances have their place in small kitchens, and deep storage drawers will come in handy for seasonal dishes or rarely used cook wear. A&S Millworks can even design the perfect place to hide your wastebasket – always accessible but completely out of sight! This is where your personal style will really shine! We’ve done everything from contemporary to traditional custom cabinets Tulsa home and business owners have requested, so we can make absolutely any idea you have for your cabinets come to life! We’ll sit down with you and discuss your vision so that we thoroughly understand your expectations. This is a step that the other guys might skip, but we’ve found that it’s the single most important element in giving our customers exactly what they want! Let us sit down with you to show off some examples of our past projects. No matter what your style, you’ll see something that reflects the look you’re going for, although each of our custom cabinet projects is uniquely designed, planned, and completed. No two are alike, even when we use similar woods and finishes. There’s something satisfying about giving each and every customer a unique product. You won’t get the same professional results for custom cabinets Tulsa has come to know and love using pre-fab or DIY cabinets. Only a professional like A&S Millworks can give you 100% unique custom cabinets! Our custom cabinets are perfect for any room in your home. From the kitchen to the bathroom or family room, we have options that will suit any space perfectly! Even if you have no idea where to start, A&S Millworks can give you some basic points to get you started! There’s nothing like having your guests “ooohh and ahhh” over your exclusively designed custom cabinets. To get those reactions, choose A&S Millworks!